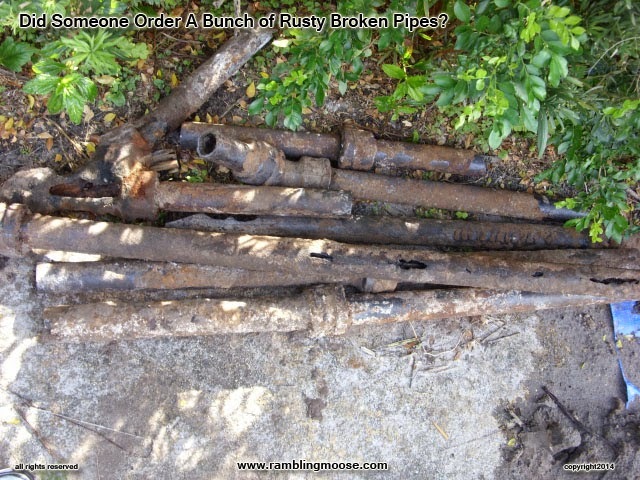 Rambling Moose: Did Someone Order Some Rusty Broken Pipes? When you run the washer, your kitchen sink shouldn't "burble". We would run the washer and every so often we would hear things. We would also find small "spills" next to it. For a little while we wondered if our dog who was then a puppy, had "discovered" the laundry room. Can't blame the dog for this one. It's old pipes. While it was only the one side of the house, we were left scratching our heads. It was time for a little education. In this little house, one side of the property drains one way, the other drains another, and there's a joint in the middle. But the thing is that pipes will fail. If you look at the pipes, you can see how they failed. In our case, I don't know that anything ever really made it out to the sewer lines. We were "fertilizing" the sand under the house. Some of those cracks eventually filled with soil that plugged up the works. One group of plumbers were called in. They fixed the minor things like worn out washers and wobbly fixtures. The bathroom sink was upgraded. The noises never really left us. We would soldier on still scratching our heads as the washer's burbling got louder. Finally we had someone in to scope the pipes. Interesting thing was what they found. After running a camera on a long snake down the pipe, they found the first crack. Our pipes had failed and cracked. The plumbers weren't sure what we had going on or where the camera was looking as the waste water from the house drained out of that crack. An estimate came back much higher than we would have liked. That's the repairman's shrug. If you don't know what is wrong, price it high and the home owner will go get a second estimate that they will probably go with. The second guy, Plumber Mike, specializes in this sort of thing. 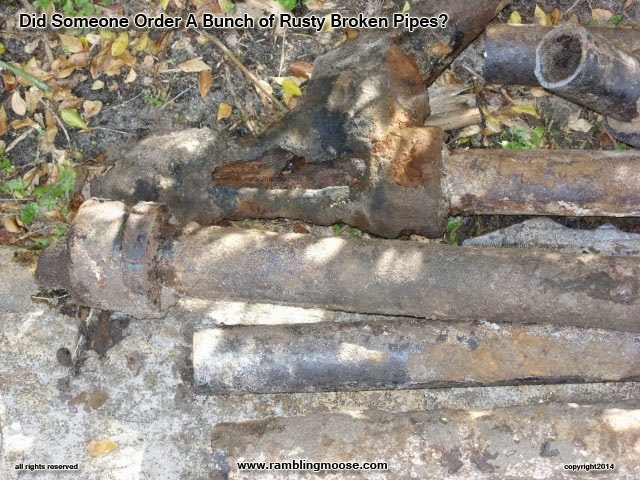 In fact, they are the ones who the first plumber contracted with for this kind of repair. The inside jobs were a different group, the original plumbers, and they were fine for that. No complaints with anyone. Last week, demolition began after permitting was completed. By Demolition, I mean burrowing under the house to expose the pipes. Each pipe that came through had more cracks in it. Since we paid our sewer bills, we really should actually use the sewers instead of inadvertently using the soil under the house as a septic field. By the time Plumber Mike was through, just about every pipe was cracked, and the width of the house was tracked with new PVC piping. 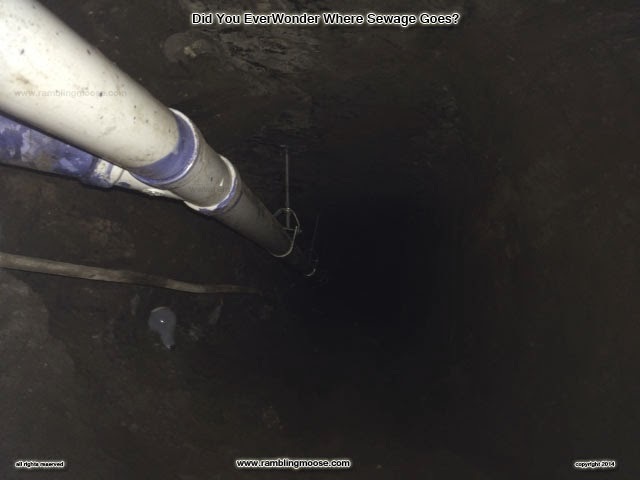 The tunnel is yet to be completely filled in, and the work has yet to be inspected, but we're now back to draining into the sewers. Ahh sewers. So dirty but so necessary to modern urban life. Without sewers, plumbers, and other necessities, we would not be able to have cities, and even villages would be difficult. At least it's back together now. No more inadvertent fertilizer for me! We can flush safely again!